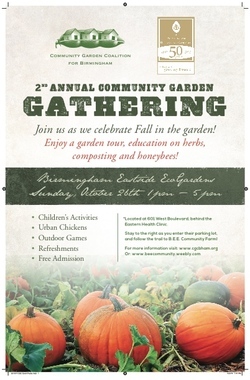 Join the Community Garden Coalition and Friends of Birmingham Botanical Gardens as they host the 2nd annual Community Garden Gathering at B.E.E. this year! Sunday, October 26th, from 1 to 5. This event will feature education on composting, herbs and honeybees, as well as children's activities, games, refreshments, urban chickens and more! Best of all it is free ! Come and help us celebrate the changing seasons, get to know your neighbors, and enjoy some tasty treats and family fun! Come out and support us at the Birmingham Botanical Garden's Earth Day 2014, "Growing Community Roots", hosted by the Community Garden Coalition for Birmingham and Friends of Birmingham Botanical Gardens! B.E.E. will be there with chickens and a chicken tractor, hopefully a preview of what is to come to B.E.E. in the very near future! The event is from 11-4, and it is free, with great music, free popcorn and drinks and lots of Urban Agriculture activities! We hope to see you there!!! visit: www.cgcbham.org for more info! Nosh, Sip and Socialize as a warm up to a new and inspiring documentary on urban farming. Your $5.00 donation to the Community Garden Coalition for Birmingham helps support local community gardens. Arrive at 6:30 and grab a local brew or glass of wine and mingle with the community at large. Showtime is 7:30. You'll be running for your shovel by the end of the film! 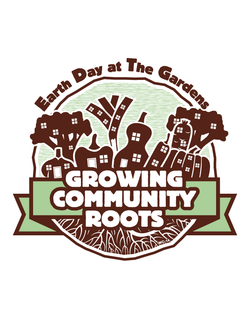 *Get your Earth Day at The Gardens, "Growing Community Roots" t-shirts early, pre-sale price only $15! Join the Community Garden Coalition and Stan Palla, the executive director of the Alabama Bicycle Coalition on an 11 mile bike tour including 3 community gardens in the Avondale neighborhood, 3 community gardens in the Norwood neighborhood, and Jones Valley Teaching Farm. The tour starts and finishes at Freshfully in Avondale, a supporter of the CGC. We will finish just in time for lunch at their new cafe! The cost of the tour is $30, which includes a organic cotton t-shirt. All proceeds from the event go to support the CGC so that we may continue to help the greater Birmingham area grow fresh food and learn about healthy eating! We hope everyone will celebrate National Food Day in Birmingham this October 26th by taking part in this fun event for the whole family!! Come out for a class on Composting, taught by William Cureton (a..k.a. Captain Compost) on June 22nd, at 10am. The class should last 1 to 2 hours, will be held at the Ecofarm, and you will learn about composting, lasagna layering, and no-till method! The cost of the class is $20, and you will receive a 50lb bag of his compost for attending! Call with questions! MUST RSVP at beecommunity@yahoo.com, or call 205-886-4789. 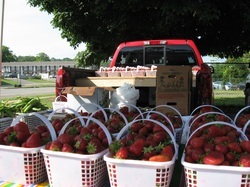 Opening of the East Lake Farmers Market and the Annual Strawberry Festival this Saturday, May 3rd from 8-Noon! Rain or shine!Mmmm strawberries! Fresh, ripe, delicious. Join us opening day and enjoy some free strawberry shortcake! Experience the smooth sounds of Marvin McCombs and Wayne Brown’s jazz guitar and piano. Sample Chef J.R. Jacobson’s strawberry salad and strawberry syrup at the cooking demo. At the kids booth we’ll have fun activities like strawberry painting and dipping. Deb Wakefield from the Bay Area Food Bank will be available to educate folks about SNAP. We have it all at the market! In addition to all the strawberry treats, experience all of our weekly offerings of the market – meet your local farmers plus some new vendors. Purchase delicious fresh produce. Peruse the booths of local artists, purchase some delicious homemade pastries, strawberry jam and strawberry lemonade. And best of all, meet your neighbors and celebrate spring! Add the market to your calendar and don’t forget to tell your friends and neighbors to join us every Saturday through October 11, 2014. See you at the market! 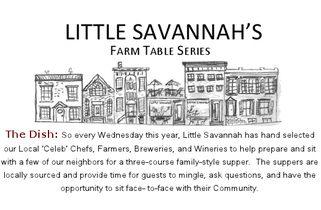 This Wednesday, April 23rd at 6:30 come out and support the Community Garden Coalition For Birmingham, support this awesome restaurant who is dedicated to connecting local farmers with the community and enjoy some great local food! Earth Day at The Gardens returns on April 27, 2013 from 11 – 4 p.m. in the Formal Garden in front of the Conservatory. This year, the annual celebration will partner with Community Garden Coalition for Birmingham to focus on the growing local and national interest in community gardening. Displays and demonstrations will feature topics such as: vegetable garden design, raised bed construction, composting, trellising, rainwater irrigation and beekeeping. Focus will be maintained on health and wellness and the benefits of good nutrition. The event is free to the public. This year’s musical entertainment will be provided by John Scalici’s eclectic and multicultural Juka Tribe. Their music, which draws inspiration and influence from hip-hop, rock, African, and Middle Eastern music, is socially conscious but not forced or overtly political. With influences as diverse as Howlin’ Wolf and Fela Kuti, the band will recall the sounds of acts like Beats Antique. Also taking place in Blount Plaza at 1 p.m. will be a Get Into The Gardens demonstration, "Easy Container Gardening: Planting Peppers." Community Garden Coalition for Birmingham is hosting a Meet and Greet February 27th, from 6:30 to 8:30pm at the Birmingham Botanical Gardens. We are working to connect the gardening efforts throughout the Birmingham area, and create a network of support! Please contact us if you are interested in attending, spaces limited! January 23, February 13, March 27 | 11:30 - 12:30 p.m.
Lots and lots of awesomeness going on in Atlanta! We are way behind the curve here people! Checkout the classes they are offering! Botanical Gardens Documentary film series - FREE!!! “Dirt! The Movie” is an insightful and timely film that tells the story of the glorious and unappreciated material beneath our feet. Inspired by William Bryant Logan’s acclaimed book Dirt: The Ecstatic Skin of the Earth, “Dirt! The Movie” takes a humorous and substantial look into the history and current state of the living organic matter that we come from and to which we will later return. August 25, 6:15pm - ALABAMA PREMIERE!!! 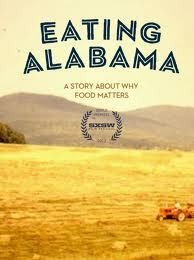 So very excited to finally show the movie in Alabama! The screening will take place on Saturday, August 25th at 6:15pm at theAlabama Theatre in Birmingham as part of the Sidewalk Film Festival, along with a ton of other great movies (see more info here). EA director Andrew Beck Grace and lots of folks featured in the movie will be in attendance. Should be a great party! Join the event on Facebook, and tell all your friends! Looking forward to seeing you soon! A LIMITED NUMBER OF ADVANCED TICKETS FOR THE SCREENING CAN BE PURCHASED HERE! CBS 42: There will be a spot on the news tonight about Community gardens in Birmingham, featuring a few of our gardens (including B.E.E. Community) in honor of Earthday! B.E.E. is working at the EcoFarm that was established by the Jefferson county department of health and the Southern Environmental Center. We believe in the original vision of the EcoFarm, on many aspects, and we are working towards this vision while implementing a Community Garden as well! Thank you for your generous donations of time, materials and support! and to Beverly Taylor with the Birmingham News for publishing BEE's first article!!! We will be having a workday at EcoFarm this Saturday! Many different things to do! Areas to clear, ground to clear, compost, etc! We will also be discussing family plots and fall planting! Bring your gloves, weedeaters, mowers, machetes, lopers, pruners, hand shovels, or anything else that might be useful! Anything you can or want to do, we can use your help! We will be having a workday at EcoFarm this Saturday! All levels of experience welcome! Bring tools, gloves, water, and come join in the fun! We will be having a workday at Ecofarm this Saturday! All levels of experience welcome! Come to work or just to visit this beautiful space! Workday at the Ecofarm March 14th 2013, from 10am to 12pm. A group of 12 from UNC Chapel Hill will be out to help us at the Ecofarm! Please feel free to join in the fun as we prepare for Spring planting!! there will be a workday at the Ecofarm in Eastlake, with BEE this Sunday, April 7th, from 1 to 5. Come and join us and help us as we start our spring planting, and tackle the many projects we have in the works! Any amount of time you can come will be appreciated! 601 West Boulevard, behind the Eastern Health Clinic, park at the clinic, and we are located directly behind them! you! If you just want to come and meet some community members and enjoy our beautiful space, please come out and support us!Remember, workers to bring gloves, sunscreen, and water! This Saturday, June 22nd at the Ecofarm, hosted by B.E.E. Community garden, join William Cureton (a.k.a. Captain Compost) for a class on composting, lasagna layering, and no-till method. Class should last 1 -2 hours. Come out and support us!